Occupy protesters from around the country converged on Philadelphia for the National Gathering. 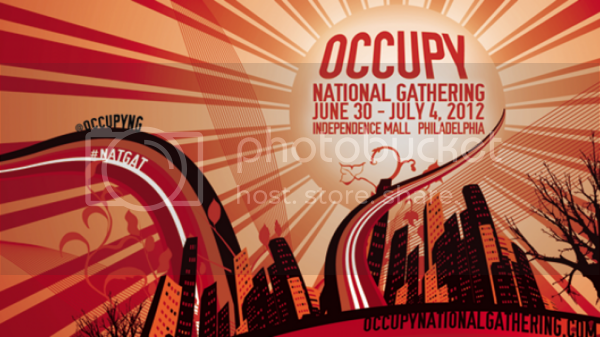 Occupy participants from around the country have converged on Philadelphia for the “National Gathering” June 30 through July 4. Organizers estimate the event will draw around 1,500 protesters and has been independently endorsed by more than 100 Occupy groups across the country. From its very beginning, the convention was less about occupation and more about building communities. “Tents more than likely won’t be necessary,” a statement on the group’s website reads. Instead, the group plans to develop a list of grievances to take to legislators, presidential candidates, and Supreme Court justices in Washington, and the event will culminate with a planned march to Independence Halls on July 4. “For me, this is a chance to finally meet face-to-face with people who are doing work in other cities and build real relationships,” said Jeff Rae, an Occupy activist who had his Twitter records subpoenaed by the New York District Attorney in March. Rae said he believes the Occupy movement is alive and well. Rae emphasized Occupy’s fledgling status—the group will only be a year old this September—and stated it takes years for movements to hit their peak. Shapiro recognizes that Occupy’s numbers have dwindled since last November, but insists that does not mean the movement is dying. Julia Alford-Fowler, another National Gathering organizer, said the “Occupy is dead” narrative is a total fallacy, and blames the peddling of it on the mainstream media. “People are involved in local movements on a daily basis. The only thing that has changed is the absence of camps in most cities,” she said. Occupy Philadelphia reports that twenty-eight people were arrested late Sunday night during a protest in Center City. Initially, activists reported they were unclear on why protesters were being arrested, but later Dustin Slaughter, a member of the National Gathering media team, said charges might be related to obstructing a highway.